Be the first to share your favorite memory, photo or story of Clarence. This memorial page is dedicated for family, friends and future generations to celebrate the life of their loved one. 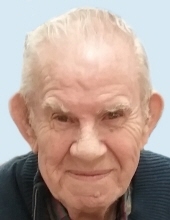 Clarence "Cack" Hunt, age 89, passed away November 21, 2018 at CHI-Mercy Hospital. Clarence was born July 2, 1929 in Mondamin, Iowa and graduated from West Harrison High School in 1947. Clarence proudly served his country in the US Army from 1951-1953 during the Korean War. His working career started at the Chicago Northwestern Railroad for nine and a half years, and then to Vickers where he worked from 1959 to 1991. Clarence was a member of F.O.E.Eagles # 38, and his hobbies included bowling and softball for RLDS-Community of Christ Church Team, card playing. He is preceded in death by his parents, Clarence and Louisa Hunt; sisters, Clara May and Louise. Survivors include his son, Randy (Pam) Hunt; daughter, Connie (Lee) Jenkins; grandchildren, Jamie (Tyler) Hansen, Amanda Hunt, Abby (Mike) Showers, Lindsey Jenkins, Nicholas (Jill) Hunt, Ryan (Danielle) Jenkins, all of Council Bluffs; great-grandchildren, Lauren, Kylie, Tori, Nolan, and Hayden and three more on their way; many nieces, nephews, friends. To send flowers or a remembrance gift to the family of Clarence Hunt, please visit our Tribute Store. With military rites by the American Legion Post 2. The family will direct memorials. "Email Address" would like to share the life celebration of Clarence Hunt. Click on the "link" to go to share a favorite memory or leave a condolence message for the family.